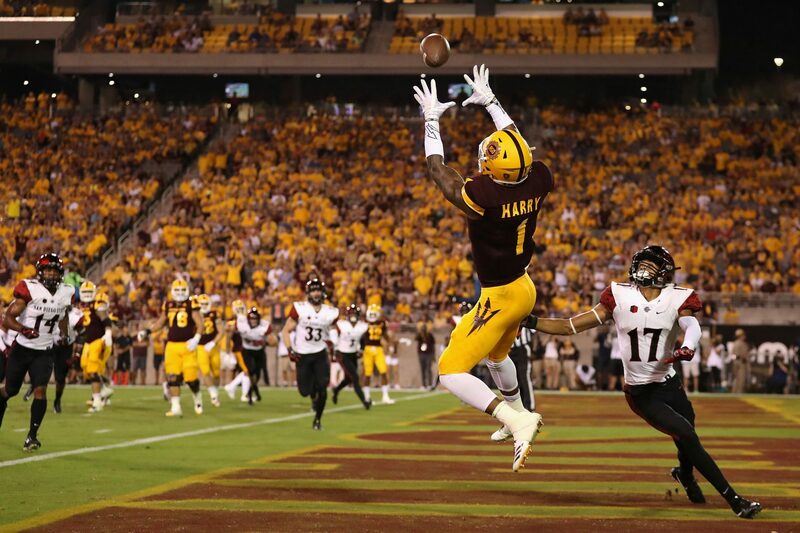 Are you starting to suffer from #DraftTwitter mock draft fatigue? Honestly, I am. There are so many mock drafts out there that I’ve actually found myself tuning out and avoiding those tweets, articles, blog posts, etc. Instead, I started to work on my own NFL mock draft. Mocking is a great way to force yourself to do some research and make qualitative decisions about specific players. It’s also the best way to define your own opinions on the players, rather than relying on the #DraftTwitter groupthink. 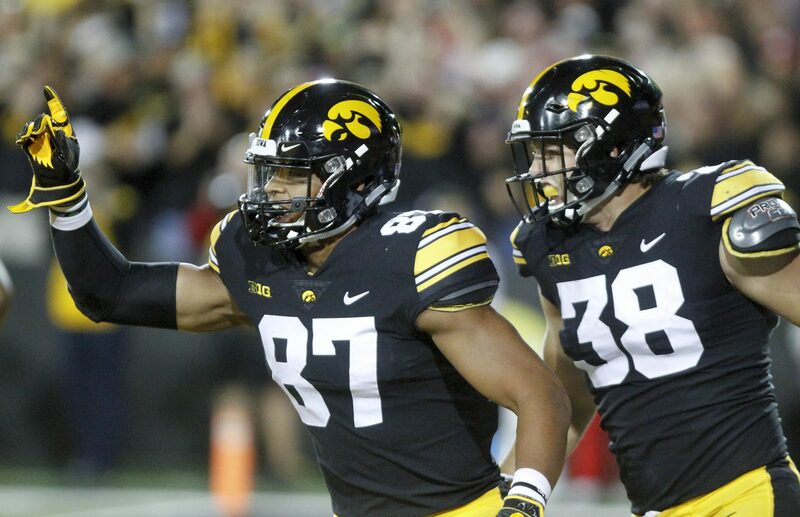 Here’s the method to my madness… I started out by creating positional rankings and tiers for each position, concentrating on players who could potentially be drafted in the Top 100. Next, I consulted my preferred team needs resource which was a community effort on the r/NFL_Draft subreddit. The spreadsheet collects info about primary and secondary team needs, scheme, draft strategy and character risk tolerance. While it may not be perfect, I think it’s more useful than most similar sites and is far better than I could compile on my own. Next, I referred to Our Lads depth charts which are my favorite (you should also bookmark their glossary). For some teams I also visited Spotrac to get invaluable information about contracts and free agency. To keep track of my picks, I am using the mock draft spreadsheet created by Reddit user Mbrr1214, to which I made a few slight tweaks. Team names are color coded for quick recognition; colored pick numbers correspond to the pick’s original owner. 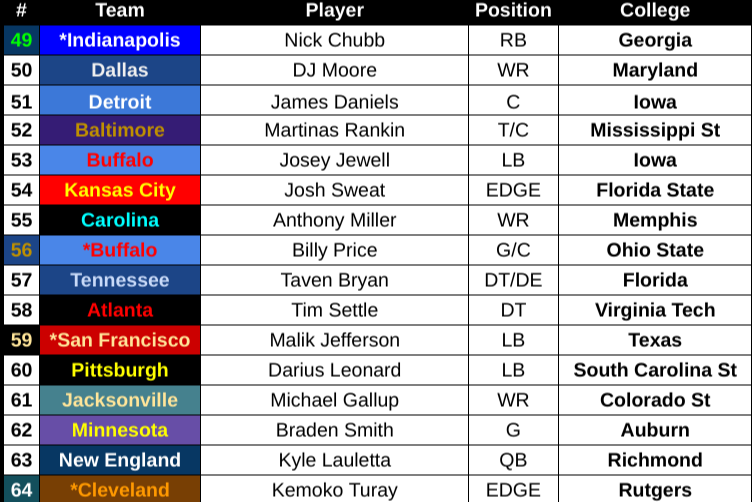 This mock draft was compiled predominantly on March 30-31 with some edits in the following days. It will be posted in pieces over the three weeks leading up to the NFL Draft so please keep in mind the dates in which it was first created should there be any breaking news in the interim. My knowledge of offensive skill players far outpaces that of offensive linemen and defensive players. That’s not to say I haven’t seen the other players play, it’s just that my analysis is more shallow. I covered many of these linemen and defensive players during the season and during my bowl previews but I have admittedly not done a deep study. I did not include any trades which can obviously turn this mock draft on its head. Personally, I think mock drafts that include trades are a cop-out and a way for the author to skirt around tough decisions. Real GMs may not always have the option of trading out of a pick and must make a decision on whether they go BPA (Best Player Available) or reach to fill a team need. For a mock draft author to say “well, Quenton Nelson is the best player on the board, let’s trade this pick to a team that needs a guard” is missing the point of the exercise. More quarterbacks will be drafted than you think and they will be drafted earlier than you hoped. Solid offensive tackle prospects are becoming less common and, as such, teams will have to reach for them nearly as often as they do for quarterbacks. If I had to build my own team, I would rarely use a top 75 pick on a running back or wide receiver. Offensive skill players, aside from the quarterbacks, fell much further down my mock than anticipated. 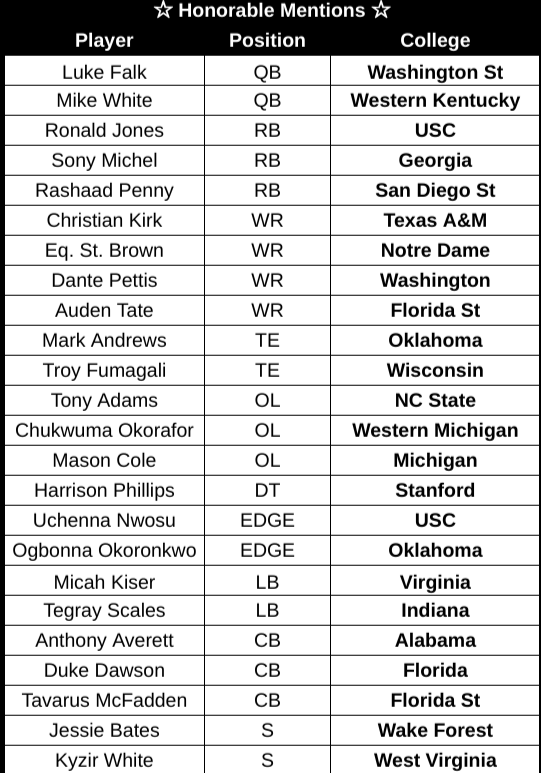 These players did not get selected in my mock but I had originally listed them as potential targets when I started my research. Since I considered them while working on this project, I thought I should share their names as they could be some of the top targets in Rounds 3 and 4. They are ordered by position then by last name – they are not ranked. Homer pick alert. With my last pick in my two-round mock, and the first one that you’re reading, I have the Browns taking Kemoko Turay. As a Rutgers season ticket holder, I have been both enticed by and disappointed by Turay. His blocked field goal against Michigan in 2014 remains one of my favorite football moments ever experienced in person at the stadium. 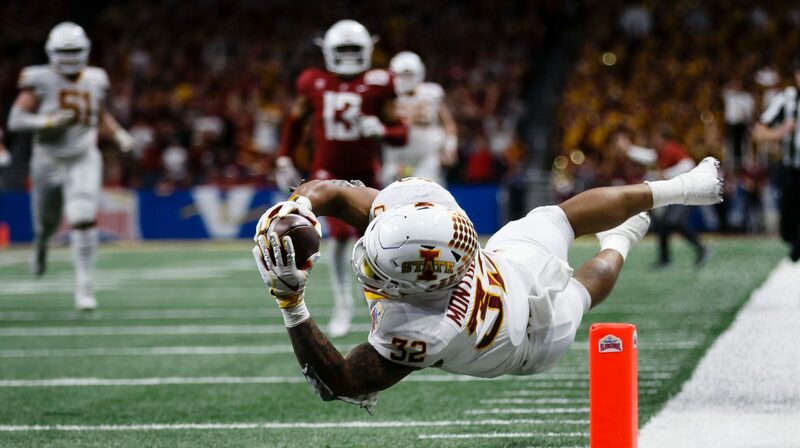 The “Kemoko Dragon” performed well at the Senior Bowl and became a darling of one of my favorite draft resources: NDT Scouting. NDT had numerous pieces highlighting Turay around the Senior Bowl but I feel like his name has fizzled a bit as of late. Turay’s career stats are marred by injuries and ineffectiveness but he has raw ability that teams covet. I use the word raw on purpose because he definitely needs some work. His senior season at Rutgers was a pretty good one: 60 tackles, 6 tackles for loss, 3 sacks. Edge rusher is not a position of immediate need for the Browns, but when you five of the first 64 picks, you can afford a luxury pick or two. The depth chart ahead of him is why I would love to see Turay taken by the Browns. He can come in and learn while he bulks up. Given time, I think that Turay will be a starting end in the league. 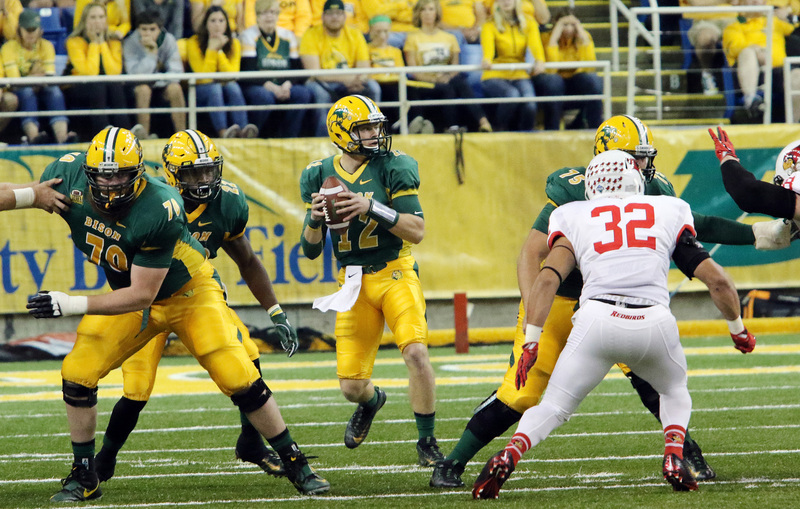 Rumors are swirling that the Patriots might take a quarterback late in the first round. I think it’s more likely that they take one here at pick #63 (mostly because I doubt they hold onto both of those late first rounders). If the Patriots pull the trigger in the first round, it would be for Mason Rudolph, whereas if they wait until the second I think it would be Kyle Lauletta. Lauletta played at Richmond in the Colonial Athletic Association in the FCS. Lauletta threw for 3,737 yards and 28 TDs last season, adding 4 rushing TDs. Lauletta has a career completion percentage of 63.5% and improved his accuracy each year as the starter. He does throw too many interceptions though, 35 over the last three seasons. My first look at Lauletta came in the lead up to the Senior Bowl when I read Benjamin Solak’s “Contextualized Quarterbacking” piece about the Senior Bowl quarterbacks. He went on to win the MVP award at the Senior Bowl, moving himself up draft boards. I went back and re-read Lauletta’s section and two words confirmed for me that the Patriots would target him: “mechanically pure.” In case you were wondering, the Pats took Jimmy Garoppolo, an FCS quarterback who thew too many interceptions but had a quick release, with pick #62 in 2014. The most immediate need that I identified for the Vikings was their offensive line. I wanted to address the line with both of their first two picks, hopefully ensuring that new QB Kirk Cousins can last for the duration of his fully guaranteed contract. Smith is my highest rated lineman on the board at this point so it was an easy pick. He was an AP All-American in 2017 and starred at the combine. Smith came in as the biggest guard (6’6″ and 315lbs) in the class. He also had the highest vertical jump and came in second in the bench press and broad jump. He’s big enough and athletic enough to hold his own across the line so he could prove to be a valuable addition to the Vikings offense. I was surprised when the Jaguars let Allen Robinson leave in free agency and then cut Allen Hurns. I figured they would at least hold onto one of them. Instead, they decided to re-sign Marqise Lee and add Donte Moncrief from the Colts. Moncrief is now the highest paid receiver on the team, but they must not be too convinced because they only gave him a one year deal. Michael Gallup has an interesting personal story which I wrote about a few weeks ago. He had numerous Power 5 scholarship offers but his test scores were not good enough so he had to go the JUCO route and then ended up at Colorado State. If he had played at a school like Missouri originally, we could be talking about the top receiver in the class. Some experts still feel that way about Gallup and trust his pedigree over his route to the pros. I like Gallup but he has a few negatives that bump him down for me. Primarily, he lacks elite measureables and is prone to losing focus. There’s a lot to like though so that seems like nit-picking. Gallup plays faster than his 4.51 forty indicates. He is good with the ball in his hands after the catch, utilizing his all-around athletic ability (he earned sixteen varsity letters in high school). I believe Gallup’s play strength is better than advertised which will be a useful trait as he adds weight for the NFL. 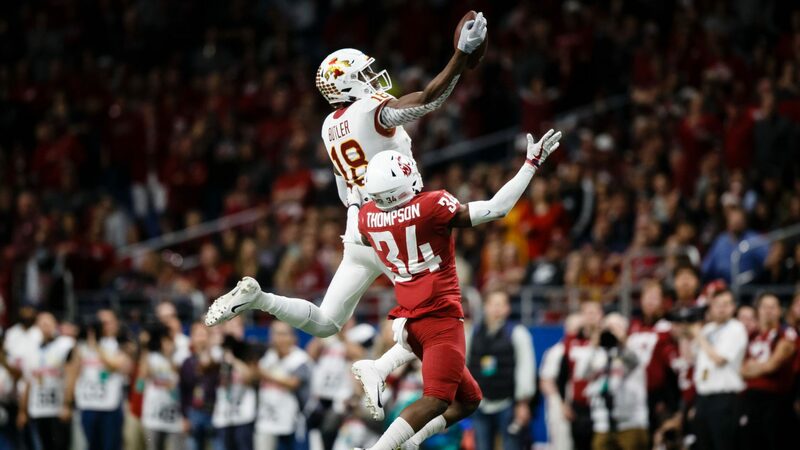 If Lee continues to ascend as he did in 2017, and Moncrief proves he’s not a bust, the Jaguars could be looking at an under the radar receiving corps this year. Similarly to the 49ers below, the Steelers brass would not have expected to need to spend draft capital on an inside linebacker if you had asked them a few months ago. Unfortunately, though, that is the reality after Ryan Shazier’s frightening spinal injury. Shazier says he’ll play again but I think it’s safe to say that that will not be any time soon. You’re forgiven if you have never heard of Darius Leonard. Leonard is a fifth year senior from South Carolina State, a 3-7 MEAC side. I had heard the name a few months back but never did any research so I decided to watch one of his 2017 game films and a highlight reel as a quick primer. Against FCS foe NC Central, he often looked like the best player on the field, showing good speed, especially to the sideline. He is effective in coverage and plays a great QB spy because he has the quickness to shadow the passer and then meet him at the edge. Leonard tallied 100+ tackles each of the last two seasons and is an adept pass rusher despite his coverage responsibilities (20 career sacks). Leonard will likely compete with free agent signing Jon Bostic for a starting role. Bostic is on his fifth team in five years so I’d put my money on the rookie. The thought of the 49ers drafting a linebacker in the second round of the 2018 draft would have seemed a little crazy eleven months ago. Fast forward though and it’s possible that San Fran needs to plan for a future without MLB Reuben Foster. Foster was arrested twice this offseason and missed six games due to various injuries in 2017. When researching his off-field issues, I also came across a story about him getting sent home from the combine last year which I had forgotten all about. Jefferson would be a good pick for the 49ers because he could fill the MLB slot until Foster returns from an anticipated suspension. Jefferson’s best position, according to Charlie Campbell and Lance Zierlein, may end up being at WLB. 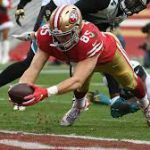 The projected starter at that spot for the 49ers is Malcolm Smith who missed all of 2017 with a torn pectoral. Either way, whether it’s in the middle or on the weak side, Jefferson will prove valuable from Day One. This feels a little early for Settle because I had at least one other DT ranked above him, however, he fits a more immediate need for the Falcons at NT. The Falcons signed Dontari Poe to a one year deal in 2017 and let him move on to division rival Carolina this offseason. Settle is big at 6’3″ and 329lbs and would be a space eater for the Falcons. Settle is a former 5-star recruit who was ranked by ESPN as the 19th best overall recruit in his class and the second best at the position. In college, he never really “settled” in. He’s a redshirt sophomore so maturity and experience are a concern, as is his low level of production. Settle has just four career sacks, all coming in 2017, and 53 career tackles. The Falcons are a pretty complete team so I think it’s best for them to address a need, even if it may be a bit of a reach. Any time somebody draws comparisons to JJ Watt, you should take note. When researching Bryan, I came across multiple sources running with the comp, including the NFL Research Twitter account. Bryan’s production continued to increase in 2017, when he finished with career highs in snaps, sacks, quarterback hits and hurries. Bryan played as a DT in a 4-3 at Florida and will likely play DE in 3-4 sets with the Titans. I expect the Titans to use multiple sets though so Bryan could move inside when they switch to a 4-3. I also envision Bryan playing inside of the 3-4 on passing downs to give offenses a different look and increase pass rush pressure. Bryan blew away the DT class with his explosiveness and agility at the combine, leading in four drills: vertical jump, broad jump, shuttle and 3-cone. This is Buffalo’s fourth pick in the first two rounds. Earlier I have them address quarterback, wide receiver and linebacker. With #56, I wanted the Bills to make a value pick for the future. If Billy Price didn’t tear a pectoral muscle at the combine, he would have been a late first round prospect. Price can play at either guard position or center, as he did for the Buckeyes, but I’d expect him to find a home as an NFL center. Sadly, starter Eric Wood was forced to retire after last season due to an injury so the Bills could use a long term solution at the position. They did sign Russell Bodine from Cincinnati last month but it’s just a two year deal with a potential out after 2018. That would be perfect timing to give Price time to recover before becoming the permanent starter in 2019. Miller is my favorite player in this draft class. His measureables don’t stand up to others in the class, which is why we find him at #55 and not at the top of the second, but I’m not deterred. Miller’s release is superb and he makes the spectacular catch look routine with excellent body control. In addition to his playmaking ability, Miller has repeatedly impressed me with his toughness and determination. There were times when he willed the Tigers to comeback or to victory, often exhausted or banged up. 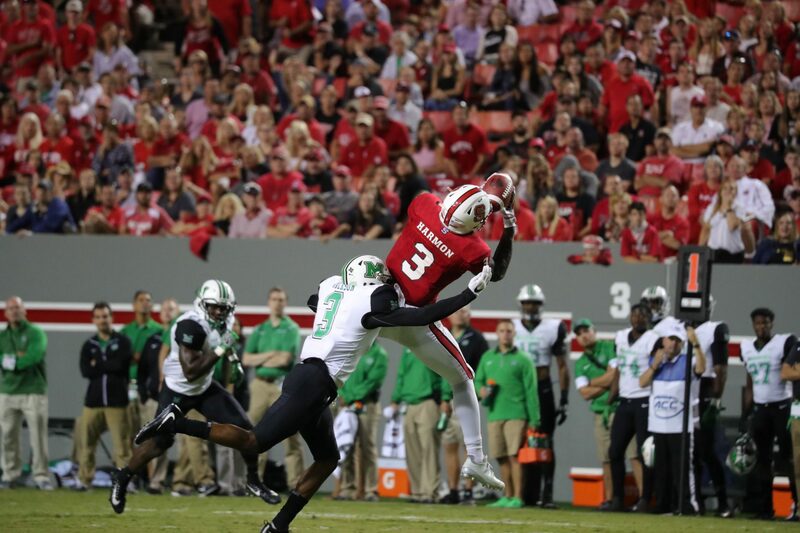 He has the versatility to line up anywhere and was Pro Football Focus’ sixth ranked slot receiver in 2017. With Devin Funchess and Torrey Smith on the field with him this season, I would anticipate seeing Miller in the slot. In terms of Miller’s long term projection, this fit works well because I doubt that either Smith or Funchess stick around long. I was of two minds when considering the Chiefs first pick of the 2018 draft (they traded their first rounder in the deal to land Pat Mahomes last year). My first thought was that the Chiefs should be cautious, opting for a sure thing since they are missing a first rounder. My second thought was that because they were missing that first rounder that they should be more aggressive and make a high risk, high reward pick. My id won out and here we have Josh Sweat. Sweat is a complicated prospect because he has a history of knee injuries that make him a risk. Those injuries though are the only reason that Sweat would be available to the Chiefs at this pick. A player with Sweat’s combine measureables (4.53 40 yard dash at 6’4″ and 251lbs) and production (29 career tackles for loss and 14.5 career sacks) would not normally be available here. It’s startling how little draft capital the Bills have invested in the linebacker position. Only two of the seven backers currently on the roster were drafted, the rest were all college free agents. Those two who were drafted, Matt Milano and Tanner Vallejo, were fifth and sixth rounders last year. The Bills drafted the position this high twice before in recent memory, in 2013 and 2016, but both Reggie Ragland and Kiko Alonso were traded away. Jewell is the next up in my linebacker rankings and he would be a good fit at MLB in the Bills system. It’s fun reading scouting reports on Jewell and seeing how the author tries to tiptoe around the fact that Jewell is simply unathletic. However, he is quite productive: he recorded 124 or more tackles each of the last three years. In his write up about Jewell, Matt Miller said that “all those hyperbolic cliches like ‘tackling machine’ actually apply to Jewell.” If history is any indication, Jewell may not be long for Buffalo but I’m confident that he would make an impact before his subsequent trade. The Ravens offensive line ranked 18th in 2017 according to Pro Football Focus. Perhaps that should come as a surprise given that the Ravens spend the 28th most, on a per player average, on the offensive line. The team spends even less at center where they rank 29th in spending. Rankin is a versatile lineman who played tackle in college but could end up playing center in the pros. The Bulldogs tried him out at center last Spring but kept him at tackle instead. 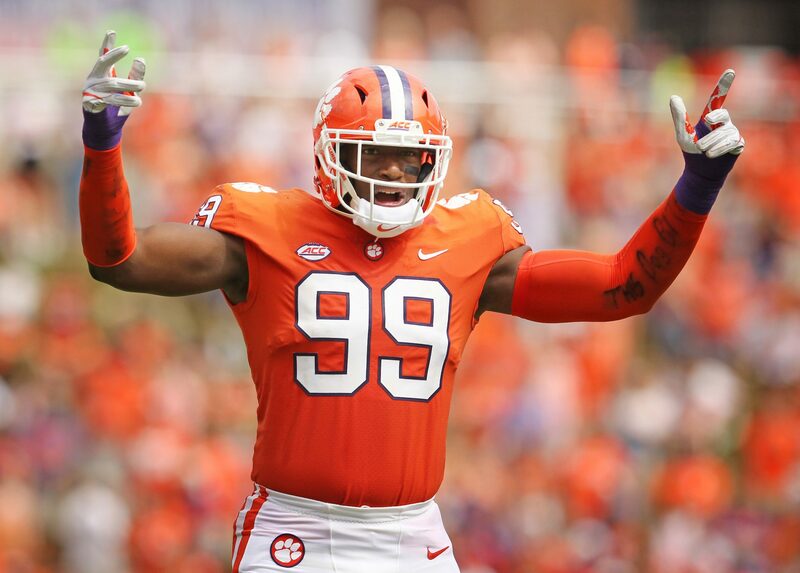 Drafting a player like Rankin would give the Ravens a lot of flexibility and could help solidify the line both at tackle and center, wherever the immediate need is. The Lions need a center and James Daniels is a damn good one. Last year’s starting center, Travis Swanson, has signed with the Jets. The Lions did sign G/C Wesley Johnson, ironically from the Jets but he doesn’t really satisfy the team need. Johnson is a former tackle who moved inside for the NFL, he’s not a true center. Neither is guard Graham Glasgow who would project as the starting center for Detroit this year if they don’t address the position. While doing some research on Daniels, I came across this highlight where he owns a BC linebacker and I couldn’t help but watch it a number of times. Daniels came in smaller than some of the other top center prospects but he showed his supreme agility by owning the competition in the shuttle and 3-cone. 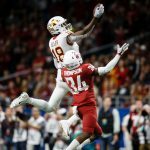 There’s been a number of rumors that the Cowboys are considering a wide receiver with their first pick, specifically Calvin Ridley I think that would be a mistake, even though Ridley is my highest rated receiver, and sincerely hope they continue to add to their already-strong offensive line instead. I’d much rather see the Cowboys wait, full disclosure that I’m a fan, and grab a receiver at this pick. I have Anthony Miller ranked higher in my rankings at the moment but I think that Moore is the more likely selection for the ‘Boys. 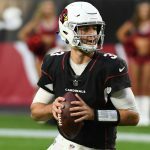 Per WalterFootball.com, Moore has met with the Cowboys on multiple occasions. Moore was not on my watch list to start the season but by the end of it he had worked his way into my positional rankings. 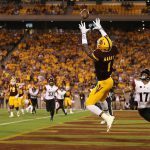 Moore is quick (4.42 speed) and explosive (first among WRs in the broad jump, second in the vertical) and runs with purpose once he has the ball in his hands. He had awful quarterback play at Maryland so the fact that he performed as well as he did at times is impressive. In my preview of Moore, I called him a “trick play master” which could come in handy when the Cowboys offense becomes predictably run-heavy. I believe there’s zero chance that the Colts head into training camp with just Marlon Mack, Christine Michael, Josh Ferguson, Robert Turbin and Matt Jones competing for running back reps. They are a lock to add a running back in the first few rounds. Mack should be the favorite to come out of that group but I don’t think he’s able to be a bellcow and none of the journeyman inspire confidence. Chubb was pegged as the top back of this class years ago as a freshman but he has since fallen down the rankings due to an ACL injury and sharing the spotlight with Sony Michel. I still prefer Chubb to Michel as a pro prospect but I do admit that Chubb’s running style likely means he’ll serve a shorter career. Chubb had three 1,000+ yard seasons and averaged 6.3 yards per carry over 47 games. His 44 career rushing TDs are fourth most in the SEC since 1956, per Sports-Reference. Chubb is not a receiving back but that’s okay because that’s Mack’s strength. The biggest knock on Chubb is his ACL injury from 2016. I’m not that concerned because he returned and completed two full seasons since then, even if he has lost some of his pop. Having a formidable running back duo will help Andrew Luck get back into form because the team will not have to rely solely on him to move the offense.